NEAGS is located in the Nichols Memorial Library, One Cabot Avenue, Gadsden, Alabama. The Cotton Mill was built in Alabama by Dwight Manufacturing to meet their competition. Converting cotton in the south saved money. And cost control is a main ingredient of Manufacturing. Howard Gardner Nichols had finished college at Harvard in 1893 and he joined Dwight Manufacturing Company. Since his father was the Treasurer, it was probably an easy decision. H.G. Nichols seems to have done well with the company and was chosen to oversee the construction of the new mill to be located in Alabama City, Alabama. On Christmas Day, 1895, one year after the announcement of the planned building of the new southern cotton mill, a button was pressed at the Dwight’s Chicopee, Massachusetts mill to set in motion the giant Corliss engine in Alabama City to begin the mill operation. In his daily journal, Howard Gardner Nichols recorded that on Friday, February 7, 1896, workers opened the first bale of cotton and threw it into the feeder. Before daylight on May 23, 1896 he went to the mill to supervise the moving of an electric generator. The night shift had worked feverishly to place the huge dynamo in its proper place. Young Nichols joined the work crew. When everything seemed secure for the final move, the huge scaffolding timbers cracked and splintered in a deafening crash as the machine and Nichols fell together. He was pinned in the rubble. He suffered severe internal injuries and remained unconscious during the morning as local physicians attended him. A surgeon was called from Chattanooga, and early the next morning, he operated on the patient in his cottage. The doctors told the parents that their son could survive but a few hours. The young man rallied, however, and the doctors gained hope for his recovery. A doctor was summoned from Atlanta to assist in the treatment. Eight days later Nichols was moved by special train to a sanatorium in Atlanta. He arrived in good spirits, confident of his recovery. He sent greetings to friends in Gadsden and instructions for continuing the work at the mill in Alabama City. Nevertheless, in mid-June complications developed, and despite the best medical care then available, he died on June 23, 1896. The Library building was constructed between 1898 and 1900. The distinctive white columned building that is now the Howard Gardner Nichols Memorial Library became the first public lending library building erected in Alabama. The Nichols Library was the first public lending library in Alabama. Another memorial to Mr. Nichols was in the lovely Union Church which featured unique Alpine architecture. His sister placed a stained glass window in the church as a gift in his memory. When the Union Church was dismantled years later, the window was moved to a special place of honor at Gadsden’s Holy Comforter Protestant Episcopal Church, where Howard Gardner Nichols had worshiped during his years in Alabama City and Gadsden. In the mid 1930’s books were transferred to the Alabama City branch of the Gadsden Public Library System. During World War II the old library was operated as a child care center so women could work in the mill. Cone Mills sold the building to the Hamil family in 1971. They operated a day care center until 1973. On June 30, 1973 the library was sold to NEAGS. Jerry Jones [now deceased] was responsible for the purchase. 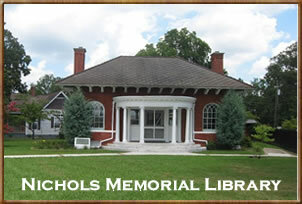 While genealogy is our goal, NEAGS’s objective is to keep the Nichols Library a Treasure of Gadsden. We are part of city tours giving visitors a taste of Gadsden History.